Delivery prices are calculated at the checkout as some products and locations come under different shipping zones. Simply add the product to the basket and the website will calculate the lowest shipping price for you at the checkout. Choose a suitable and convenient delivery between our Standard or Express delivery options. We offer a single fixed price delivery on all orders. We are now also able to ship to Europe for a small postage fee, simply add the product to the basket and the website will calculate the lowest shipping price for you. We have secured this flat rate fee with our couriers enabling us to ship to Europe. 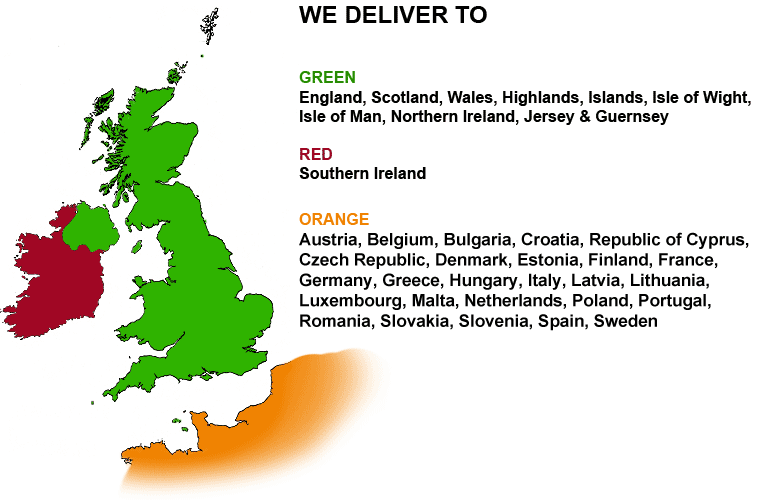 Simply select your country when placing an order at the checkout.